We made it to seventy-seven! Martha on the 19th of May, and I today, the 23th. (Yes, I married an older woman.) So far, 2018 has not been a great year. My mother passed away on April 15th at the age of 98. Double pneumonia sent me to the hospital in March, and it looks like I’ll be going back there soon for a knee replacement. I have tried everything I could to avoid surgery for the knee—injections of lubricants and, finally, a stem cell injection. Unfortunately, none have worked. The good news is that I have started on a new book. I have not yet put "pen to paper" so to speak, but the idea is there, and research has begun. I can’t be sure that I will stick to this new idea, but I’m already having fun with it. It seems that the military is rethinking its concept of leadership. The old school method has been about “drilling” into the warrior’s DNA obedience to orders and the chain of command. Now technology is driving warfare in a new direction—one that isn’t compatible with filling the ranks with graduates of old style boot camps. Military thinkers are beginning to envision a battlefield without boots on the ground—a time when then the top gun of the air force could be a paraplegic who has never left terra firma to win the wings he or she wears. Only time will tell where this idea leads me. Tom Trebing is the person I turned to to design of the covers for all of my novels. It is his imagination that makes Tom’s art so wonderful. His pieces range from the serious to the whimsical, from lifelike to abstracts that just make you feel better, but he is at his best when he lets his imagination loose to create art with his uniquely fresh childlike perspective. You’ll find that magic on display in his series of paintings at https://www.imaginehood.com. The best part is that you can purchase one of his art pieces for as little as $150.00. I have two of Tom’s original paintings in an upstairs guest room. They have followed me from house to house and always bring a smile and a chuckle to visitors. So if you want to add a little magic to your home, or to the home of a grandchild, order one of his prints by going to www.imaginehood.com. Or if you would like more information you can email Tom at tomtre@imaginehood.com. Believe me, when I say I would rather have been anywhere other than where I was. 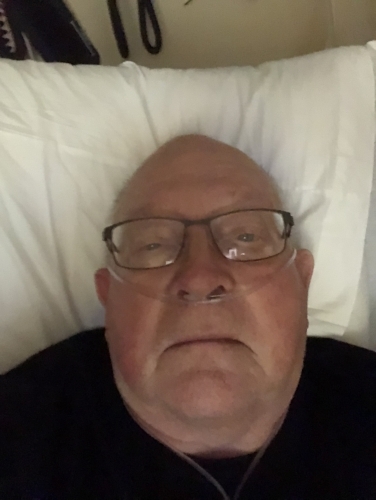 I was in the hospital—double pneumonia. It all started innocently enough. It is spring time in Tennessee, so my primary doctor concluded that I had a touch of a cold along with a heavy dose of allergy. Then he packed his bag and left for a medical conference in Brazil! Things only got worse from there. Intense coughing and difficulty breathing. I had opted for a concierge doctor in hopes that such an arrangement meant improved access and medical attention. With my concierge doc off in Brazil, I called his office and told the assistant I was coming in anyway, and that I needed one of the other doctors in the group to see me. I do have to say they shuffled schedules as needed. The backup doctor got to me without much of a wait—took blood samples and a chess x-ray. Since I had difficulty breathing and some leg swelling, the substitute doctor apparently decided my problem was heart related. He concluded the coughing was due to excess fluids. The first step was to reduce the fluids to stop the coughing, and then they would arrange for a heart workup. The doctor prescribed some “water pills” to reduce fluids and sent me home. The uncontrollable coughing continued, and I was no longer able to sleep. After two days, I called the doctor and reported that I was still having trouble breathing and could not stop coughing. Their answer was go to emergency room. I did, and the emergency room staff was top touch. They did a CT scan shortly after I arrived and determined I had double pneumonia. Finally, with the correct diagnoses I started getting the treatment I required. Am I over it now? No, I’m out of the hospital but weak and still short of breath. I think it is going to take quite a while before I’m anywhere close to well! Of course, I will certainly follow up with the heart specialist. I suppose it is possible that some heart problem may have contributed to the onset of pneumonia. I hope that isn’t the case. My ticker seems to be ticking away just as it always has. People talk about the cutting room floor in relation to movies. But do you ever stop to think that there is a cutting room floor for books. Not all the draft content for a novel makes into the final manuscript. There are many reasons. For example, an editor decides that a particular piece doesn’t move the story forward. Sometimes, political correctness comes into play as in an editor saying “you can’t put that in there, it will turn readers off.” Sometimes, a draft just gets rewritten and the initial content is forgotten. Then there are bloopers. Yep, they happen in the written word as well as the movies. Rather than drive to the commandant’s suburban offices in Virginia, I had reserved a table at the Capitol Hill Club. The commandant and his sidekick spook had agreed to join me there for lunch. If we needed more privacy for the negotiations, the Club has a number of small meeting rooms we could adjourn to. The Capitol Hill Club is in the shadow of the Capitol. That part of D.C. is pristine with its white marble and stone buildings that constitute our seat of government. Unfortunately, the areas of D.C. that we had to drive through to get there were a stark contrast—decaying townhouses occupied predominantly by blacks. I have to confess that more than once when the car stopped for a red light, I uncomfortably felt the stares of big young black men. The majority of D.C.’s black population is sustained by welfare. There are government jobs for some of them, especially among the black female population, but I am always struck by the absence of blacks in other jobs in the city. I’m in the District frequently, and I seldom see blacks, especially male blacks, among the wait staff. Let me know if you would like to see more from the cutting room floor. You can email me at tom.collins@i65n.com. For signed copies of books by Tom Collins, go to the TomCollinsAuthor.com. Unsigned print and eBook editions are available from Amazon, Barnes & Noble, and other online bookstores. For Amazon go to www.amazon.com/Tom-Collins. For an audio edition of The Claret Murders go to http://amzn.com/B00IV5ZJEI. eBook editions are also available through Apple iTunes’ iBook’s Store and Smashwords.com. For the new adventure novel on Amazon go to Diversion: a Mark Rollins Adventure. Published by I-65 North, Inc.
Time to go home again. Hopefully the Franklin birds have moved on to find another sucker with a bird feeder and an unlimited budget for bird welfare. I leave behind well fed birds of Sanibel who actually work for their food. Sanibel Island is known for its shells which were mysteriously missing this year. I understand that the missing shells are the result of result of unintended consequences from the September 2017 big one—Irma. Apparently, Irma cleaned out the crustacean beds lying off Sanibel’s shores. That wasn’t something anyone was expecting. Sounds like something our government might have been in charge of. Congress is the master of unintended consequences. Had a great time in the Sun except for adding a two-inch gash in the top of my head. Just as I was raising up, getting something out of the car trunk, the trunk lid decided to come down. The local doctor put things right, and I live to write another day. Until two weeks ago, Amazon had the exclusive right to market the eBook edition of my latest Mark Rollins mystery, Diversion. That exclusive period ended January 21, 2018. The eBook edition is now available for Barnes & Noble’s Nook, and the ePub edition is available from most eBook retailers and online book services including Smashwords. Within days it should become available, like my other five books, in Apple’s iBooks. Speaking of iBooks, if you are among the many people who use The Language of Excellence as a management guide, download the book on your iPhone for an easy to use and always available reference tool. Work is also underway for an audio edition of Diversion. I had the opportunity on January 28th, to listen to some of the completed chapters. I was impressed with the clarity and professionalism of the reader’s voice. If you prefer to listen to your books as your drive, you’ll be happy to know that within a few weeks Diversion with join The Claret Murders on Audible. Depending on demand, I may add the other three Mark Rollins mysters to Audible. On January 23th, I spoke at the breakfast meeting of the Exchange Club in Brentwood. The topic was my book, Diversion. Of course, that also included discussing the opioid crisis. Diversion is a fictional story, but that doesn’t mean that the opioid problem isn’t real. I was recently interviewed for the website Serious Reading. One of the interview questions was “How realistic are your books?” – and this was my answer. "I particularly like the disclaimer that my lawyers came up with. It has been on the copyright page of every one of my novels. This is a work of fiction. While some of the names, character, places and incidents are products of the author’s imagination and some are real, the events depicted herein are entirely fictitious and should not be considered real or factual. I originally posted The Long Tail Business Strategy in 2013. It is even become applicable today. In fact, I just completed a guess post on seriousreading.com explaining how the Long Tail relates to the book business. If you are an author or otherwise involved in the business of books you will want to read the post on seriousreading.com. Regardless,however, of what business or activity you are engaged in, the Long Tail is affecting your life, and it is something you should understand. Here is the 2013 original post in its entirety. In modern times, enterprises have had business models that have been heavily influenced by the law of Disproportionate Results—the 80/20 rule. In the world of brick-and-mortar, 80% of results were traditionally derived from only 20% of the activity—sales, inventory, paperwork, jobs, space, etc. Management’s job involved constant diligence to eliminate low yield or nonproductive activities. Unfortunately, that often meant a decline in service and a slow but relentless movement toward sameness. It was as Toffler had predicted a world of unlimited choices—all the same. You can have anything you want as long as it is within the 20% of alternatives that 80% of the population wants. The 80/20 rule is still important when dealing in tangibles but something important has happened. No longer does the 80/20 rule dominate. It is called the Long Tail, and it is the new dog on the block. In the digital world, the right side, or tail end, of the bell-shaped normal curve goes to infinity without ever reaching zero. When the cost of maintaining inventory, handling transactions, and distributing products or services drops to near zero, the Long Tail of the bell curve becomes as rewarding as its center—the center that used to account for 80% of all activity. Today you can have any song, any book, and any video—even though they, long ago, became no longer economically feasible to keep on store shelves. Today’s excellent businesses look for opportunities to operate in the Long Tail while being mindful of the 80/20 rule in other aspects of their business. Nor does one's product or service have to be digital to gain some of the benefits of the Long Tail. The key is to reduce the cost of maintaining inventory, handling transactions, and distributing the product or service. When these cost are reduced, the Long Tail benefits become realizable. When it comes to sustaining their financial success, we have seen printer manufacturers shift their emphasis from hardware sales to the profitable revenues produced by selling the ink used by that hardware. The ink has low inventory and distribution cost when compared to those costs for the hardware. We see coffee services shift from relying on the profitability of the coffeemakers to the revenues produced by selling the coffee used by the coffeemakers—the coffee having a lower inventory and distribution cost. Excellence companies look for ways to capitalize on the Long Tail while being considerate of the 80/20 rule. For more about the Long Tail check out the man who wrote the book--Chris Anderson author of The Long Tail. For signed copies of books by Tom Collins, go to the TomCollinsAuthor.com. Unsigned print and eBook editions are available from Amazon, Barnes & Noble, and other online bookstores. For Amazon go to www.amazon.com/Tom-Collins. For an audio edition of The Claret Murdersgo to http://amzn.com/B00IV5ZJEI. eBook editions are also available through Apple iTunes’ iBook’s Store and Smashwords.com. For the new adventure novel on Amazon go to Diversion: a Mark Rollins Adventure. We have over 150,000 subscribers, fans and followers. We deliver catalog recommendations to over 5,000 bookstores and libraries. We send thousands of recommendations to readers looking for their next read." Question: "Have you ever written a character based on the real you in some part?" Answer: "My wife complains that there is too much of me in the character Mark Rollins. Make no mistake, Rollins is a fictional character, but what makes for realistic fiction is a dollop of realism. Rollins is my main actor, and it was natural for me to build him on a framework I knew well. Thus, he lives in the surrounding where I live. He frequents the same restaurants. He likes the same food, drinks the same wine, etc., and that makes it much easier for me to write stories that ring true." A story in the Tennessean reported that drug and alcohol abuse saps two billion from Tennessee economy annually. Good enough reason to join nearly 200 other counties and cities in a lawsuit against certain pharmaceutical manufacturers and distributions of prescription opioids. Litigators maintain that the output of these sources vastly exceeds the legitimate volume of these medications for their intended medical purpose. The excess is being diverted for non-medical recreational use. This diversion leads to destructive addictions. Causing ordinary people, even extraordinary people, to engage in unordinary behavior. The kind of behavior feeding the plot of my new adventure mystery, Diversion. The story of this new Mark Rollins Adventure pulls back the curtain on the illegal use of these powerful drugs and their impact on communities like those filing the law suit. The Diversion story has its beginnings in New England, New Jersey, Southern Florida, and the Middle East, then the pieces converge in small town Middle Tennessee including Williamson County. The main actors in Diversion live in Franklin, Nashville, and Miami. Much of the action take places in Manchester and Tullahoma Tennessee. That area is the home of Bonnaroo Music Festival with some seventy-five thousand attendees and the Arnold Air Force Base which operates the most advanced flight test facilities in the world. Nothing flies, except through Arnold! 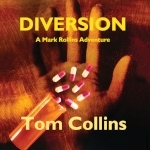 You can purchase Diversion on Amazon.com, or for a signed copy go to tomcollinsauthor.com/new-release. 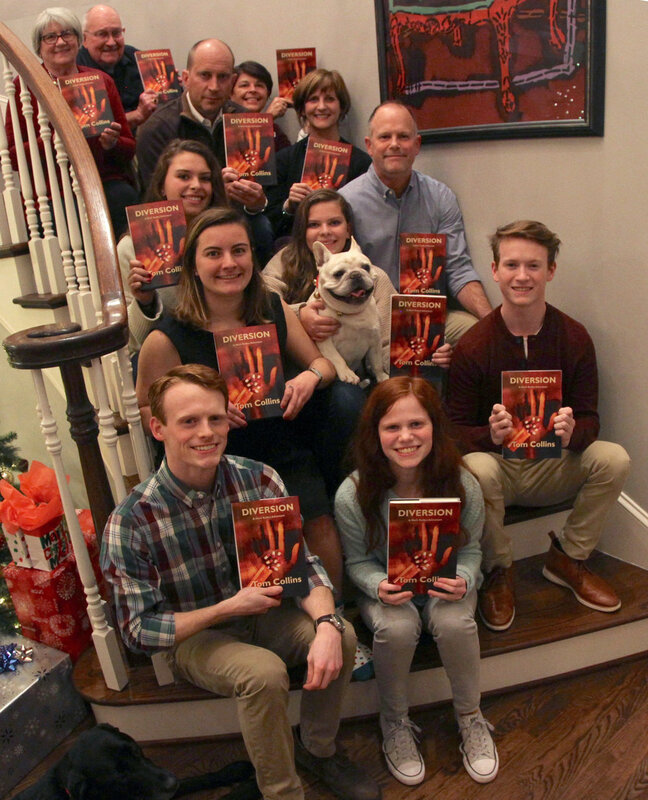 For signed copies of books by Tom Collins, go to the TomCollinsAuthor.com. Unsigned print and eBook editions are available from Amazon, Barnes & Noble, and other online bookstores. For Amazon go to amazon.com/author/tomcollins. For an audio edition of The Claret Murders go to http://amzn.com/B00IV5ZJEI; eBook editions are also available through iTunes’ iBook’s Store and Smashwords.com. For the new adventure novel on Amazon go to Diversion: a Mark Rollins Adventure. Mark Rollins And The Rainmaker is book #2 in the Mark Rollins adventure series and should be of particular interest to anyone involved in the practice of law or law office management. Yes, it is fictional mystery. But, it deals with real life law office management issues. As for the story, it's Nashville and someone wants to kill Bunny's much older husband, a prominent attorney, the law firm's public face--its rainmaker. Mark Rollins, a retired technology entrepreneur, has become the creator/owner of an exclusive fitness center catering to socially elite women of Nashville. In Mark Rollins and the Rainmaker, someone is trying to kill the husband of a fitness club member. Her husband is a prominent Nashville attorney--the rainmaker for his law firm. Rollins sets out to unmask the villain before it is too late--a task that proves dangerous, and the danger spreads as the diabolical killer's targets expand. To pick up the killer's trail, Rollins and his colorful MBA sidekick, Mariko Lee, pose as financial consultants hired by the law firm. Mariko discovers that the seeds causing many law firms to self-destruct and that in this case provide a motive for murder can be found in the numbers. As they close in on the villain's identity, Rollins and his team race against the clock to unravel the killer's final desperate plan.